Serving those who suffered human and roadway injuries with care and delivering results. When you need a lawyer, you want one who will handle your case with care, treat you with dignity and respect, and work their hardest to obtain the best possible result. We are Minneapolis trial lawyers dedicated to putting our clients’ needs first, repairing harm, and making things right. Since 2009 it has been our privilege to help people who were harmed and hold wrongdoers accountable for misconduct. We are fortunate to have recovered millions of dollars for our clients as fair compensation for their harms and losses. Let us help you in your fight to set the scales of justice right. 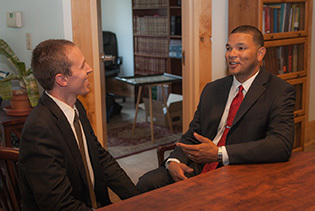 We will stand by you every step of the way—from our first conversation until your case resolves through a settlement or trial—and we will do everything we can to help you achieve a favorable result and get your life back on track. We help people who suffered human and economic injuries in these types of cases: Employment Law, Whistleblower Rights, Civil Rights, Health Records Privacy, and Class Actions. We are cyclists, and we help fellow vulnerable roadway users who were injured in bicycle accidents, pedestrian accidents, and electric scooter accidents.